Our pastor, the Rev. David Thompson, joined our church staff in September 2010. Prior to moving to Billings, he served the United Presbyterian Church in Jamestown, North Dakota, as pastor for 14 years. Dave was raised in Alaska, California, and Washington. 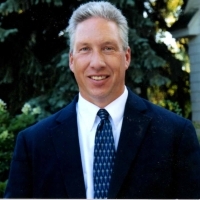 He attended Montana State University in Bozeman receiving a degree in Business Management in 1991. He and his wife, Vicki, were married in 1992. Dave worked as the Director of Christian Education/Youth Director at the First Presbyterian Church in Casper, Wyoming, prior to entering seminary at the University of Dubuque (Iowa) Presbyterian Theological Seminary in 1993 and graduating with a Masters of Divinity Degree in May 1996. Dave and Vicki have three children, Sara, John, Erin. Vicki is employed by the Billings School District as a 6th grade teacher. Dave enjoys participating in sports, playing the guitar, working with youth, fishing, spending time with his family, and reading. Dave serves as a volunteer police chaplain for the Billings Police Department and serves on a board with Habitat for Humanity. Dave’s e-mail address is pastordave@fpcbillings.org. Dave can also be found on Facebook.